This is a copper alloy horn-cap ULAS. 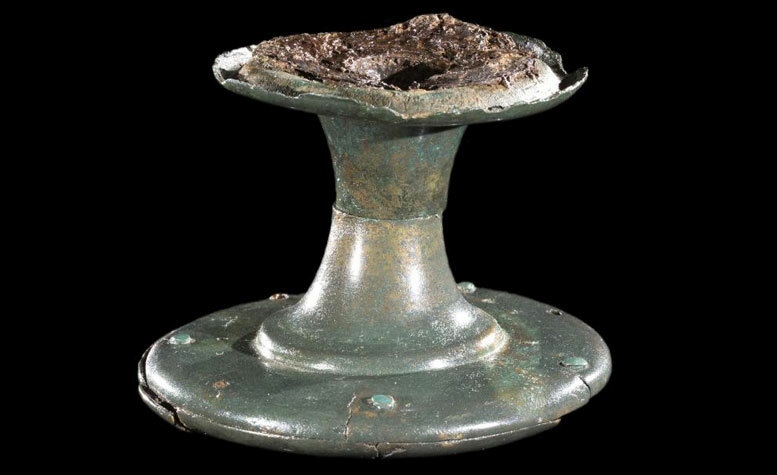 A unique collection of Iron Age metal artefacts which sheds new light on feasting rituals among prehistoric communities has been discovered by archaeologists from the University of Leicester during an excavation at Glenfield Park, Leicestershire. 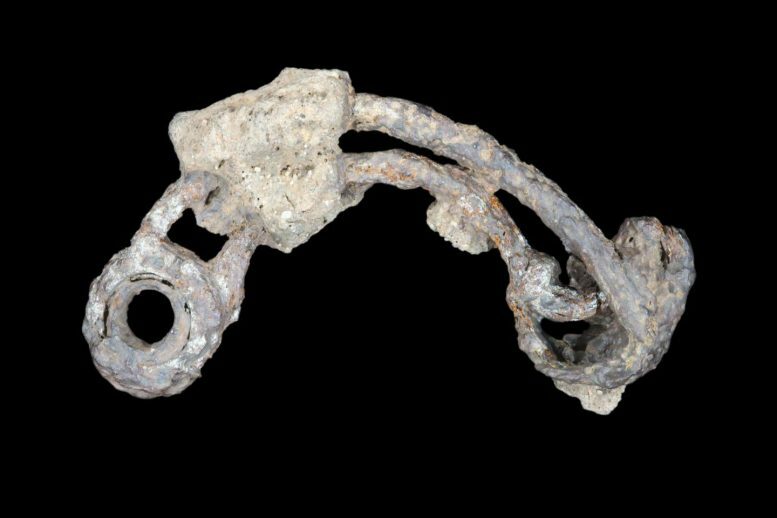 Prehistoric cauldrons, ancient sword and assorted metalwork among nationally significant findings. This is an iron involuted brooch ULAS. 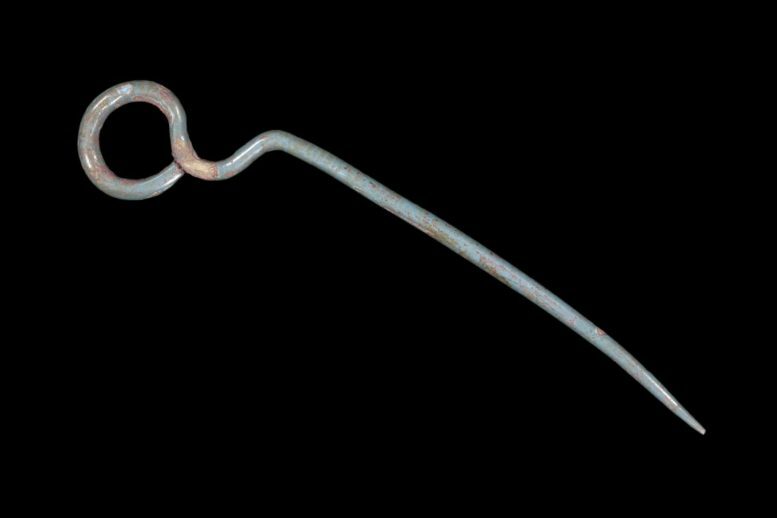 This is a copper alloy ring-headed dress pin ULAS. These repeated acts mark the site out as a potential ritual and ceremonial center that also hosted large feasts. John Thomas, director of the excavation and Project Officer from the University of Leicester Archaeological Services, said: “Glenfield Park is an exceptional archaeological site, with a fantastic array of finds that highlight this as one of the more important discoveries of recent years.” Early occupation of the site during the earlier middle Iron Age (5th – 4th centuries BC) was relatively modest, consisting of a small open settlement that occupied the south-facing, lower slopes of the spur. Slightly later in the middle Iron Age, indicated to be in the 4th or 3rd centuries BC by radiocarbon dating, the settlement underwent striking changes in character. Individual roundhouses were now enclosed, there was far more evidence for material culture, and rituals associated with the settlement involved apparently deliberate burial of a striking assemblage of metalwork. They appear to have been a variety of sizes, with rims ranging between 360mm and 560mm in diameter, with the total capacity of all cauldrons being approximately 550 liters, which illustrates their potential to provide for large groups of people that may have gathered at the settlement from the wider Iron Age community of the area. They were initially investigated at Paul Strickland Scanner Centre in Middlesex, a leading medical imaging center specializing in cancer which had CT-scanning equipment large enough to accommodate the soil blocks. Be the first to comment on "Archaeologists Discover Unique Metal Artefacts, Shed New Light on Prehistoric Feasting"